One issue large membership organizations face is retaining their member base. Here’s an example of our retention marketing and creative. This ad was created for AARP to be placed in their AARP Magazine. 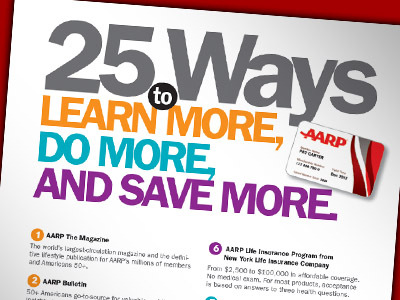 The purpose of the ad was to show AARP members the broad value of their membership. Like a reminder that there are benefits they have access to that they might not be taking advantage of. We wanted the ad to look like an editorial piece and something that the reader might engage with. Bright colors were used to make the ad seem fun and inviting – and also give it somewhat of a subway map look.